Black Trumpet Mushrooms are also known as Horn of Plenty (Craterellus cornucopioides). The season is from late summer to late autumn. The flavor is best after they have been dried, they have a sweet earthy richness that goes a long way to flavor soups, and stews and casseroles and they go particularly well with white fish for their flavor and as a great contrast. 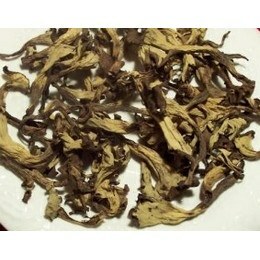 The fresh to dried ratio is 12 pounds of fresh to 1 pound of dried. To use: Reconstitute 1 ounce mushrooms in 2 cups warm water for 10 minutes or overnight in the refrigerator, strain through a coffee filter or paper towel and use the liquid for recipes. Store in the freezer for best results, repackage into freezer bags once the bag is opened.